Two bedroom air-conditioned apartment on the 2nd floor of a fully refurbished elegant old building with lift access and free Wifi and telephone for locals calls. Fully equipped fitted kitchen (dishwasher, washing machine, microwave). All the rooms have beautiful fitted wooden floors and double glazing. One bedroom is double, the other is twin. The living room has a modern sofa and television. The bathroom has bath, shower and bidet. I am a Spanish woman who has been living in the UK for the last 20 years. I decided it was time to find a new home in Spain - somewhere to escape to for my holidays, and eventually to settle down in. After spending a lot of time thinking about where I most wanted to be, I decided that Cadiz was the perfect city. Somewhere I could happily live full time. Near the sea, and with fantastic food, music, dance (I'm a Flamenco dancer) and culture. I fell in love with this apartment the first time I saw it, and I had to fight tooth and nail to get it ! I think I was very lucky. It's in the best part of the city, and the renovated building and my apartment in particular is gorgeous. The views over the Alameda and the sea, the peace and quiet in the evenings, despite being right in the heart of one of the most vibrant and exciting cities in the south of Spain. And to see the very best Flamenco shows, I have to walk only two minutes to El Baluarte de Candaleria. A fantastic restaurant only a minute away: Balandro (really one of the very best on Cadiz), and my favourite bar (El Veedor ... check out the tortillas) is just a short stagger away. Now you can use my garage space free of charge within the building, there is a lift which takes you from the apartment into the garage. People tend to leave books. Please feel free to swap one of your books! This apartment is immaculate . It’s owner , Ana , has equipped it to the highest standard and every small detail considered to make you feel at home , The location was perfect for us. Immediately into the small squares to eat and drink coffees - a few metres from the glorious parks and the walk along the sea front. Highly recommended and we hope to come back and stay . Thank you so much for taking the time to write such a positive review. It always makes me extremely happy to learn that I make my guests so happy. It would be my pleasure to have you back in the future. Fabulous apartment in a fabulous city! Ana's apartment is the perfect apartment to stay at to enjoy a trip to Cadiz. A spacious 2 bed apartment, beautifully designed, bright, very clean and well equipped. The apartment is seconds walk from the Alameda Apodaca and within easy walking reach of everything in the old town of Cadiz. Ana is a fantastic host, she gave us great advice in advance of our stay. Alejandra, the caretaker, made herself easily understood despite our very limited Spanish. Would highly recommend this apartment to anyone visiting the fabulous city of Cadiz. Very bright, clean, spacious apartment in a great location across the street from the sea front and a park. Everything one needs is included, highly recommend! Lovely bright clean apartment. Good location for bars, restaurants and really just about everything. Thank you Ana and Alejandra for your apartment! A great location, the design of the apartment was brilliant and the kitchen/bathroom so well stocked it was a pleasure to be there. All the recommendations provided were great and enabled us to make the most of our week in Cádiz. We even enjoyed using the car lift! And the shower... its amazing! Thank you again, Ana and Alejandra. Thank you so much for taking the time to write such a positive review. We try our best to provide our guests with the best possible service we can offer. It makes me extremely happy to see that our efforts are recognised. It has been a pleasure having you, if you wish to come back please do not hesitate to contact me again. This apartment is fantastic and I believe it is the best location if you want to spend some time in Cadiz. The neighbourhood is situated in one of the most beautiful and peaceful neighbourhoods of the old town of Cadiz. 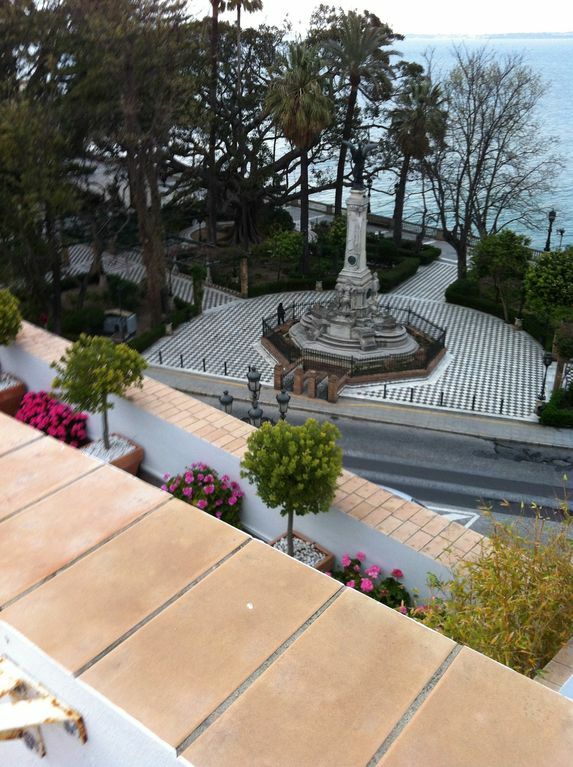 As you step outside of the apartment you find the tranquil shady gardens of Alameda Apodaca overlooking the sea. Within a stone's throw you can find some of the best tapas bars in town. And you are less than 15 minutes walk to the famous La Caleta beach. Our minimum booking is 3 nights with a supplement charge of 60€ for stays shorter than a week. To make a confirmed reservation we require 100% payment through the website, otherwise a minimum deposit of 30% with the balance paid 1 month before arrival by bank transfer. Alternatively you can pay 50% deposit with the balance paid in cash on the arrival day. PLEASE NOTE, the garage is included in the price, there is no additional cost. Ask for more information!